The Detroit News is reporting some good news about what could have been a sad story. 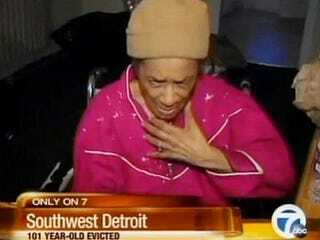 It is the story of 101-year-old Texana Hollis, who was evicted in September from the house in Detroit where she'd spent a little over half her life. Her son apparently failed to pay property taxes to uphold a reverse mortgage taken out in 2002. But after numerous news outlets reported her story, the U.S. Department of Housing and Urban Development reversed its decision to evict her. Still, the home has to be brought up to code because HUD deemed it an unsuitable living space. That is where the help comes in. She seemed full of life Tuesday after hearing that people including actor/filmmaker Tyler Perry, U.S. Rep. Hansen Clarke, D-Detroit, and a woman from Afghanistan had reached out to her. "Whatever they were saying, it was good," Hollis said, acknowledging her difficulty hearing. "And Lord knows I appreciate every one of them. "During my lifetime, I helped a lot, a lot of people. Never in this life would I ever think that it would come back to me." Brian Sullivan, a spokesman for the U.S. Department of Housing and Urban Development, said two days later she could return to the house "for as long as she wants," but the house still has a padlock on the front door. Hollis has been living with family friend Pollian Cheeks on the 8100 block of American Street on the west side of Detroit, less than a mile from her old home. The Detroit News reported Sunday that Hollis had not yet moved back into her house because HUD didn't think it was a suitable living space, citing sanitary and structural issues with the building. Offers of help have also included thousands of online queries about making repairs on the home. We hope that people follow through on these offers and that Hollis is back in her home as soon as possible. We wish her well.